LANDesk Software, a global leader in systems lifecycle management, endpoint security and IT service management, and Pironet NDH enter into a partnership in cloud computing. LANDesk will offer LANDesk Service Desk as a SaaS (Software as a Service) model from the Pironet NDH business cloud. Pironet NDH is able to offer this solution using its high-security data centers for LANDesk customers in Germany, Austria, and Switzerland. 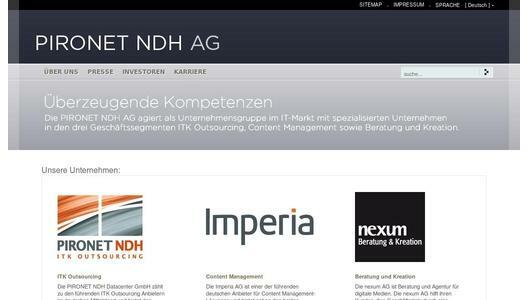 Pironet NDH is a leading ICT service provider for German small and medium sized businesses (SMBs) and offers IT services and applications based on advanced sourcing models such as SaaS and cloud computing. At the same time, Pironet NDH also uses LANDesk solutions internally. "Due to the consistently positive experience we have seen using LANDesk for our own service processes, we are very pleased to be a SaaS partner for LANDesk Service Desk. The SaaS variant offered by LANDesk is an ideal complement to operating the solution on your own server infrastructure," says Gudula Küsters, Head of Service Desk at Pironet NDH. For IT environments, where a cloud-based service desk makes the most sense, LANDesk Service Desk as a Service offers one of the most feature-rich cloud solutions for IT service management. LANDesk Service Desk as a Service offers an equal variety of functionality and as the same ability to implement ITIL processes as LANDesk Service Desk on premise. This solution includes LANDesk Service Desk technology meansusers can log their own incidents, LANDesk Service Catalogue, offers a complete overview of the services that employees can request, and LANDesk Web Desk which allows IT analysts and IT administrators to access Service Desk using a web browser. It can be used like every other typical cloud-based solution, where all of the data and services can be accessed over the Internet. "With Pironet NDH we have found a very professional hosting partner for the delivery of LANDesk Service Desk as a Service in German-speaking countries", says Holger Höft, Sales Director of LANDesk Germany GmbH. "We look forward to working with Pironet NDH and to be able to offer a mature Service Desk as a Service solutions from LANDesk combined with the outsourcing expertise of Pironet NDH." LANDesk Software is a leading provider of systems lifecycle management, endpoint security, and IT service management solutions for desktops, servers and mobile devices across the enterprise and in the cloud. LANDesk enables IT to deliver business value by gaining control of end-user computing with a single console, light infrastructure, and ITIL solutions that deliver significant ROI for thousands of customers worldwide. LANDesk is headquartered in Salt Lake City, Utah, USA, with offices located in the Americas, Europe and Asia Pacific. For further information, please visit the company's website at www.landesk.com.